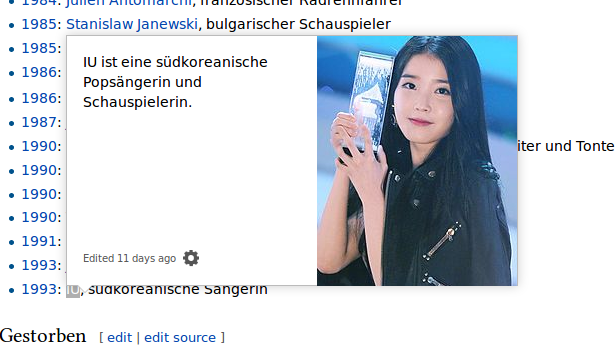 By the way: I am not sure if the error in the IU article now occured again because I changed the photo or just because I saved. I mean, it might could also have occured if I just would have changed the text in the article... I don´t now the reason for this failure. A problem could be the Korean template or just the Korean letter, cause in this article, everything works fine: https://de.wikipedia.org/wiki/Jun_Ji-hyun. If we open any link in new tab and come back to original page, the hover card is still being shown and does not hide until we open another hover card. Happening only sometimes. This issue is tracked at phab:T68261. Thanks for reporting. You can visit this page and lookup phrase "Гатис Калниньш". When you hover on the link, it brings up a card that cuts half way through. Same happens when hovering over a few other links in that table, e.g. Вит Римкус, Гирт Карлсон (they all point to articles that include the lang-latvian template in the beginning). Another problem: the hovercards show images from an article's templates when an article has no other image. However the images of templates are most often too unrelated to the article's topic to be used as its image. Example: Wikipedia:Agnes Boulton shows an image of Wikipedia:Eugene O'Neill. Please disable exclude template images as potential images or otherwise properly restrict the possible hovercard-image. Note: the app has the problem as first reported here. And another problem: when hovering over Wikipedia:Sci-Hub (example) it shows the photo within the text while it would be better if it showed the logo of the Infobox website. Not sure why that isn't done anyway -> shouldn't hovercards always show the first image in the article (with some exceptions)? @Fixuture I think they should but for now they seem to ignore any images in the e.g. Person template (and maybe all and any templates?). @SSneg Well then I guess they should be disabled for all templates with the exception of all the infobox templates. I've requested more detailed information about exactly how Extension:PageImages works (which is what selects the images in the Hovercards extension amongst other uses), at Phab:T129183. When hovering over links to articles which begin with a template, the content of this template is shown. I think the first few "real" sentences are more useful. One example is the current version of https://de.wikipedia.org/wiki/Ecuador-Erdbeben_2016, linked from the main website of the German Wikipedia. It doesn't work in my computer, or it seems. What's wrong?